Take control of the health and productivity of your employees - and increase profit. WellCompForLife is R&R Insurance Services’ total solutions approach to that will provide your company with the tools to increase the life span and productivity of your employees - and ultimately your bottom line! The top three driving trends impacting an employer’s bottom line are Obesity, Workplace Injuries and the Aging Workforce. Findings show that obese workers were more likely to report occupational injuries, with a great frequency of strains and sprains, along with falls and overexertion injuries. Consider these statistics: A comparison of obese employees to normal weight employees: 50% more workers’ compensation claims, 13x more lost work days, 7x higher medical costs, 11x indemnity claim costs. And this is just the workers compensation part. The negative effects of obese employees on your health insurance costs are overwhelming. Diabetes, heart disease, chronic pain - can all be attributed in part to being overweight. That means you have to do something about it - employee wellness programs, fitness, healthy eating, lifestyle changes for your employees and their families. 2. Reduce Workplace Injuries: Reduce the injuries to reduce the work comp claims! Slip-and-fall injury prevention: ensure a safe working environment by maintaining parking lots and sidewalks; encourage employees to wear appropriate footwear for wet or slippery conditions. Make sure you have handrails at all stairwells and inclines/declines - special attention to this for your aging workforce. Ensure employees can meet the physical requirements of the job: consider a post-offer, pre-employment physical for new employees – be sure the physician covers medical history as it may reveal something not seen during the physical (the cost of the test would pay for itself when preventing a back or shoulder claim!) Pay special attention to your aging workforce for their physical requirements. Wellness programs to aid injury prevention: help prevent strains, sprains, and falls by improving flexibility, strength, and balance. Great examples is starting a flex and stretch program, cover part of a gym membership, or hold exercise classes like yoga, Pilates, or Tai Chi.Also, having a structured return-to-work program has several benefits, the most important of which is the reduction of lost-time (lost-time has 3 times greater impact on your workers compensation premium dollars than a no-lost-time claim). There are literally dozens of ways to increase safety and reduce injuries at your place of work. If they aren't apparent to you, bring a knowledgebroker in - we'll take a look around and give you some pointers. Experts predict that by the year 2020, 25% of the US workforce will be 55 years or older. Couple this statistic with the fact that most people are working past the traditional retirement age of 65 and organizations need to pay special attention to this sector of the workforce. On average, older workers are injured less frequently than younger workers. However when older workers are injured, it will be more severe and have a longer recovery time. See Preventing Injuries in an Aging Workplace. R&R Insurance has found that if businesses address the health of their employees, reduce their number of injuries and keep a close eye on ways to accommodate the aging workforce, you will see a significant positive effect on your bottom line! 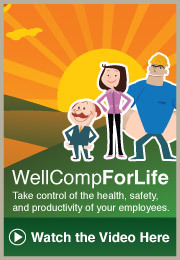 WellCompForLife processes will increase the health and longevity of your employees and their families giving you a lot more control over your health and work comp insurance costs, all while improving the productivity of their employees. This is control business owners don't realize they have. At R&R Insurance, we call this program WellCompForLife! Join the WellCompForLife discussion on LinkedIn! For more information about WellCompForLife, contact a knowledgebroker today!